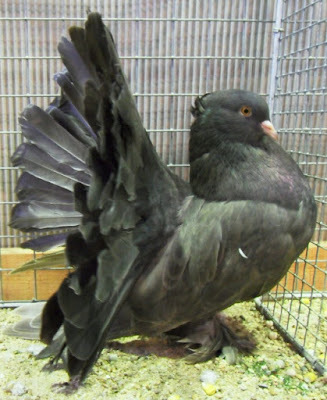 One of the oldest and best known of the fancy pigeons, the Fantail was developed originally in India and improved to its present state by breeders in the UK and the US. 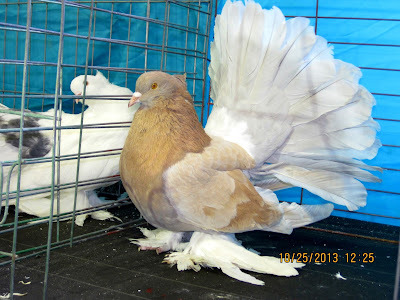 There are 2 common forms: Indian Fantails and American Fantails. The Indian fantails are much larger, crested and have feathered feet. They also have a fairly natural stance, while the American form stands on tip-toes and leans way back, with head almost buried between the breast and tail. The birds strut about on tiptoe with their large fan-shaped tail displayed and their head pressed back into it. The head shakes and twitches as the bird dances about. They are found in many colors, the most popular of which are White, Black, Blue, Red, Yellow, Silver, Dun and various Splashes. The tail should be cut back during the breeding season as it interferes with mating. Fantails are generally not very good parents and it is often necessary to foster rear the young on another breed.